The existence of the blood-testis barrier has been established morphologically and physiologically in some experimental animals such as guinea pigs, rats and mice. Since the seminiferous tubules were not stained by intravenously injected dyes, it was at first assumed that the blood-testis barrier probably located in the capillary wall of the testis, as with the blood-brain barrier (Kormano 1967). By cannulation into the rete testis of the ram, however, it has been demonstrated physiologically that there are some differences between components of testicular fluid and testicular lymph, and that the components of blood and testicular lymph are almost the same. Some substances tested (urea, ethanol, Na, K, Cl, creatinine, etc.) passed into the testicular fluid and testicular lymph, while others (inulin, para-amino-hippuric acid, albumin, etc.) passed readily into the testicular lymph but did not enter the testicular fluid. 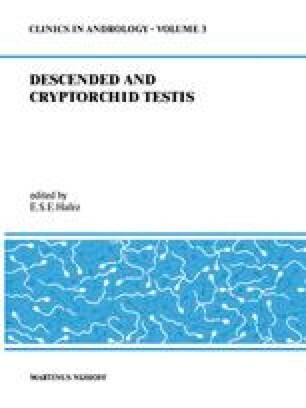 It has been concluded, therefore, that the blood-testis barrier is not in the capillary wall but in the peritubular wall (Setchell 1967, 1970). Electron-microscopic study, using the tracer method, has revealed that the penetration of the electron-dense tracer into the seminiferous tubules was prevented by the tight junction between the myoid cells and the Sertoli cell tight junction (Fawcett et al. 1970). At present it is considered that the myoid cell layer acts as a partial barrier while the specialized Sertoli junction constitutes a basic and essential blood-testis barrier.